Whale watching is still the fastest growing sector of general wildlife tourism worldwide and this is important for Québec, since marine tourism is a lucrative activity. According to a recent report, 13 million people went whale watching in 119 countries in 2008, compared to 9 million in 87 countries in 1998. (1) In the past 10 years, the whale watching industry has grown at an average rate of 3.7% globally, although with slight variations. For example, it grew by 13% in Asia, Central America and the Caribbean, by 10% in South America, Oceania and the Pacific Islands and by 7% in Europe. Although North America remains the largest whale-watching destination as it hosts almost 50% of all whale watchers worldwide (Table 1), the sector’s growth there has slowed to 1.5% per year. Marine wildlife observation, particularly whale watching, is a well established part of the nature experience in Québec and the hotspot for this remains the Saguenay-St. Lawrence Marine Park (SSLMP). In this area covering 1,245 km2, a variety of marine creatures (including rare species such as belugas and blue whales) can regularly be spotted, even in close proximity to the shore. Although the number of whale watchers has grown internationally, a general decline has been observed in the last 10 years along the Atlantic coast of North America. Québec is an exception, posting modest growth between 1998 and 2008 (Figure 1). 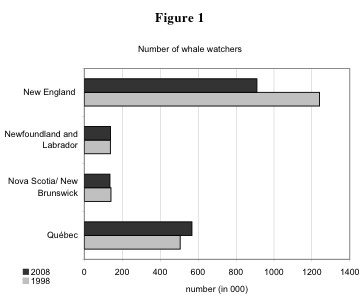 Meanwhile, fewer visitors participated in whale watching in neighbouring destinations, with numbers declining by 25% in New England but only slightly in Nova Scotia and New Brunswick. The impact of fewer whale watchers along the Atlantic coast of North America in the past 10 years is a drop in the number of tour operators offering whale-watching activities (Figure 2). However, the reduced number of tour operators in Québec is due primarily to business consolidation. Although whale watchers are generally satisfied with their visit to the marine park,(5) there is also growing concern that the services offered are not entirely meeting demand, meaning a proportion of people may not be getting what they want out of their wildlife-viewing trip. According to recent visitor surveys, while visitors are generally very satisfied with the area, the educational component is weaker, with surveys showing only 46% of visitors are satisfied with their learning experience. This suggests that education and learning are not fully integrated into the visitor experiences currently offered. The fact that the majority of visitors observe wildlife from large motorized boats and cruise ships is an indication that marine wildlife viewing is very much oriented to “mass” nature tourism. Some visitors also express concerns that several tour boat operators seem to be chasing after whales. 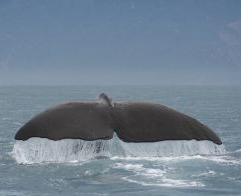 The whale-watching industry has reached a certain maturity in Québec, compared to other destinations, although it appears to be a viable activity for now in the context of the North American Atlantic coast. Some of the issues raised in the Saguenay-St. Lawrence Marine Park suggest that the tourism sector could reassess its approach to operations management and work to find a balanced co-existence with conservation. It is in the industry’s interest to manage wildlife observation more responsibly, so perhaps there is a need for a sector-wide educational toolkit, as well as some voluntary measures, such as certification and a code of ethics for responsible operations. The local tourism industry could also collectively reconsider how to positively contribute to the conservation value of the park, since it is a protected area and an industry hotspot. Other things to review include the type of experiences offered, and what actions could be taken to ensure that the interests of the growing, and more eco-conscious, responsible travel market are also met. The park and industry alike could benefit by making interpretation a more integral part of the visitor experiences offered. Besides teaching people about conservation issues, they could encourage a variety of other low-impact activities already offered in the wider Saguenay region, such as those along the Whale Route. 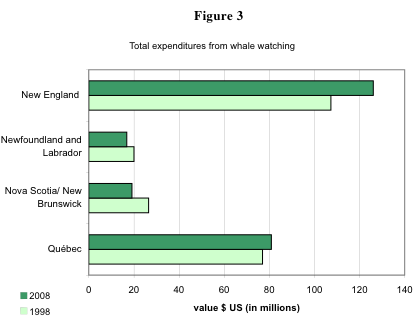 (1) O’Connor, S., Campbell, R., Cortez, H., & Knowles, T. (2009) Whale Watching Worldwide: Tourism numbers, expenditures and expanding economic benefits, a special report from the International Fund for Animal Welfare, Yarmouth, MA, USA, prepared by Economists at Large. (2) Parks Canada. (2005) Visitor Survey. Québec Service Centre, Parks Canada Agency. (3) Saguenay–St. Lawrence Marine Park. (2008) Report of the public consultations on the Review of the Management Plan. Saguenay St. Lawrence Marine Park. 43 p.
(5) Gosselin, D. and Priskin, J. (2009) Présentation dans le cadre de l’atelier de travail collectif sur les activités en mer au Parc marin du Saguenay—Saint-Laurent. September 9-10, 2009, Tadoussac. (7) Gareau, D., Pagé, M., Balej, R., Langlois, D. and Désaulniers, J. (2009) Activités en mer au parc marin du Saguenay-Saint-Laurent. Document de reflexion 2009 aux fins de discussion. Parc marin du Saguenay-Saint-Laurent, Tadoussac. 30 p.